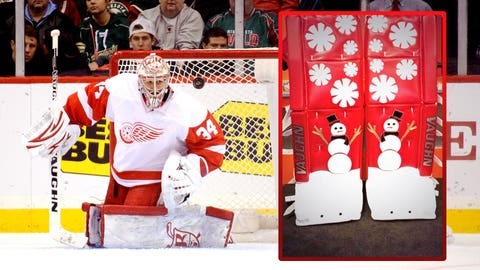 Petr Mrazek may not have the most intimidating goalie pads for the upcoming Winter Classic, but he certainly has the most festive ones. The Red Wings goaltender will be sporting some holiday-themed equipment when he takes the ice at either The Big House on Jan. 1 with Detroit or at Comerica Park with the Wings’ AHL affiliate, the Grand Rapids Griffins, on Dec. 30. As Puck Daddy points out, Jimmy Howard should be healthy for Detroit’s outdoor game on New Year’s Day, and Mrazek, who has seen action in two games with the Red Wings this season, will likely be taking on the Toronto Marlies during the Winter Festival matchup.